Seasonal closures for raptor protection along the Deschutes Canyon Rim February 1 August 31. Maston is known for its great winter riding. However, in the summer it can get hot, hot, hot. Gorgeous high desert views of juniper, cascades and raptors. It consists of rolling and relatively flat terrain that is fun and flowing. 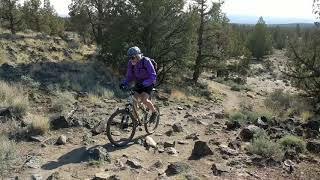 The eastern edge has some fantastic Deschutes Canyon views, but pay attention to the trail so you don't fall! Horses are popular here, along with bikes....each having their own trails. No matter, give the right of way to the horses if you do see them. There are a few rocky sections, but easy to walk around if you prefer. A section of the eastern edge of the loop (Rim Trail), skirts the Deschutes River Canyon. The trail is rocky in spots, and the exposure is big. It's a fun and beautiful section, so walk it if you need to, but watch for other riders, and tread lightly on the fragile ecosystem surrounding you. There are no trail markers yet, though the trail is well established, and the new parking area on the South side is impossible to miss, it's huge. There's a restroom and several picnic tables at the trailhead. The Juniper Trailhead to the north is an optional starting/ending point for this ride. Vic fell once. Could not shift. Learned how to on way back. Easy looping trail through the high desert. Nice views of the Sister. soggy almost around the entire loop with the exception mile marker 5 up to Juniper Trail. Look for the Big Tree along the trail. Some areas closed to bikes year round. Canyon rim trail intersection and signage.